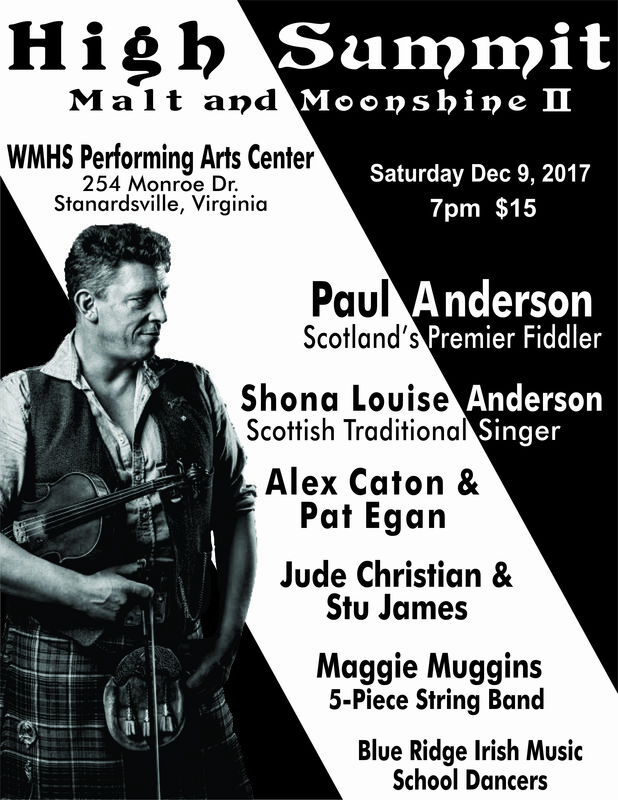 Scotland’s premier fiddler, Paul Anderson, and his wife Shona, an award-winning singer of traditional Scottish songs, will headline a concert in Stanardsville on Saturday, December 9th, at the William Monroe High School Auditorium. Tickets are $15. The Andersons will be joined by local musicians Alex Caton & Pat Egan, Jude Christian & Stu James, the five-piece string band Maggie Muggins, and dancers from the Blue Ridge Irish Music School. This event is a reprise of the hugely successful Malt and Moonshine concert held in Stanardsville in 2015. The musicians will also have a conversation about the connections between Scottish, Irish and Appalachian music, and in particular, the influence of Scots-Irish music on traditional Old Time Americana music.